Brad Wright of Wright on Health has an excellent edition of Health Wonk Review, which shines a spotlight on research. Brad notes that, going forward, research will be incredibly important as health reform is implemented and evaluated. He offers a fine research roundup from leading healthcare bloggers – check it out! The importance of timely reporting – In Manucy v. Joe Manucy Racing, The Louisiana Court of Appeal recently ruled that an employee who was injured during horse training was ineligible for benefits because although the injury was immediately apparent, the worker did not file for benefits until about a year and a half after the injury occurred. Louisiana law stipulates a one-year from date of injury filing deadline for injuries that are immediately evident, and two years for injuries that do not develop immediately. In this case, the injury was immediately apparent, requiring ambulance transport and surgery within two months. State law varies on statues of limitations for benefit eligibility, most commonly falling between one and three years from date of injury. Many states offer some exceptions to the statutes – such as starting the clock ticking at date of disability rather than date of injury or allowing exceptions if there is conduct that might be regarded as deceptive on the part of the employer. Going and coming – As a rule, any injuries that happen to an employee when they are traveling to or from work – ‘going and coming’ – are not compensable, but there are exceptions. Fortney v. AirTran Airways, Inc. deals with one of those exceptions: service/benefit to the employer. In this case, the employee was killed in a plane crash while flying on a reciprocal arrangement with another airline. The Kentucky Supreme Court upheld benefits to the estate of the deceased. 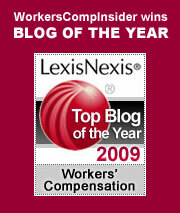 At Lexis Nexis Workers’ Comp Community, Roland Legal PLLC summarizes the issues: “Whether an employer uses transportation or transportation expense as an inducement for an employee to accept or continue employment is material to supporting compensability, particularly when the journey is sizeable and when the employer pays all or substantially all of the expense.” See our prior post about common exceptions to the ‘going and coming’ rule. Medicare – Get your popcorn and follow along as Joe Paduda offers a guide to the status of the Medicare “fix” and looks at various scenarios for how things may play out. Retroactive Insurance in Georgia – events continue to play out in the wake of the insolvency of Southeastern U.S. Insurance Inc (SEUS) in Georgia (a story in and of itself, and worth a read if you haven’t been following along). After the SEUS demise, many employers were left holding the bag for the open claims of injured workers because they had not paid into the state’s insolvency fund and were therefore ineligible for coverage. New legislation will cover employers retroactively if they pay into the state insolvency fund, but the Georgia’s Insurers Insolvency Pool has filed a challenge to the new law. “The pool is placed in a position of uncertainty as to whether the legislation imposes duties and obligations on the pool retroactively in violation of the Georgia state constitution,” the filing says. Fee Schedule in Maine: Interest without the Conflict? We return to the beautiful state of Maine, where moose wander the woods looking for whatever interests a moose and where employers self-insured for workers comp look for a fee schedule. The moose are a lot happier than the self-insureds. As we have pointed out in prior blogs, the legislature mandated the creation of a fee schedule for medical services nearly 20 years ago. There is still no fee schedule. So while insurance carriers are free to negotiate with hospitals to determine rates, self-insureds – Bath Iron Works (BIW) the most notable and vocal – are stuck paying the exorbitant “usual and customary” fees. BIW has sued a number of times to move this process to a conclusion. Most recently, they sued to remove Paul Dionne, chairman of the workers comp board, from heading up the fee schedule committee. Dionne is also board chairman of Central Maine Healthcare Corp., which includes Central Maine Medical Center in Lewiston. While he claims objectivity, Dionne is in an untenable situation: you do not ask a medical provider how much they want to cut their own revenues. In deference to the “appearance” of a conflict of interest, and perhaps in an acknowledgement that after 20 years, enough is enough, Dionne has recused himself from any further involvement in the fee schedule process. So from here on Dionne will follow the debate from the sidelines: no conflict, but plenty of interest. His confidence in the other board members might give rise to anxiety for BIW. Regardless, this is surely a step in the right direction. When it comes to the long-mandated, long-absent fee schedule, patience is wearing a bit thin in Maine. The moose may wander where they choose, but self-insureds are caught in a very expensive trap. Too bad they don’t sell fee schedules at L.L. Bean. Posted in Insurance & Insurers, Medical Issues, State News | Comments Off on Fee Schedule in Maine: Interest without the Conflict? A sewer may not be the preferred place to begin the work week, but the working world calls and we must follow. About a year ago, we blogged the sad story of Shlomo and Harel Dahan, respectively the owner and heir of S. Dahan Piping and Heating company in Queens, New York. They were hired to vacuum an 18-foot-deep dry well at a plant owned by Regal Recycling. Harel went in first. When he failed to emerge, his father went in after him. When the father failed to surface, an employee of Regal, Rene Rivas, went in after them. All three were overcome by deadly fumes at the bottom of the well. All three died. Now we read in the New York Times that Sarah Dahan, Shlomo’s widow and mother of Harel, brought the remains of her husband and son to Israel for burial. She left the company in the hands of Ygal Lalush, a trusted employee. In her absence, Lalush changed the locks, stole the company’s four trucks, wrote $30,000 in company checks for his personal benefit and started running the company out of his own home under a different corporate name. Ms. Dahan discovered the problem when she returned from Israel. She first tried to resolve the issue directly with Lalush. When that failed, she went to the authorities. Lalush has been charged with fraud, grand larceny, forgery, possession of stolen property and falsifying business records. We could conjecture about the frailty of human nature and the dark shadows that accompany us all as we make our way through the world. We could wonder at the transformation of a loyal employee into a pathetic crook. (Perhaps his lawyer will chalk it up to post-traumatic stress syndrome!) That aspect of this tale will remain forever hidden, like the contents of the sewers cleaned by S. Dahan Piping and Heating. The take-away from this tale lies within the Dahan family: the father who tried in vain to save his son. The mother who fulfilled a commitment by burying her husband and son in Israel and who tried unsuccessfully to convince her wayward employee to abandon his demented plan. There is genuine dignity in these people, who deserved both a better fate and a higher class of employee. The saga of the New York self insurance trusts continues. We reported in April that justice had been served by Judge Kimberly O’Connell, who ruled that requiring solvent trusts to pay for the sins of insolvent trusts was unconstitutional. Now, according to Work Comp Central (subscription required), O’Connell herself has been overruled by a four judge panel, which has reinstated the assessments on the solvent trusts. While the justices are undoubtedly correct in their literal interpretation of the law, the ruling comes under the heading of “let no good deed go unpunished.” It may be legal, but it is in no way just. Here’s the (rotten) deal: 15 self-insurance trusts are shut down by the state. They ran out of money because they under-priced their premiums, under-reserved claims and sold insurance like a ponzi scheme. Oh, they also paid themselves handsomely for their fine work as administrators. These defunct trusts are in the hole to the tune of $500-$600 million. State oversight? There wasn’t any. The WCB decides to assess the remaining, solvent trusts to make up the deficit. In other words, the “joint and several liability” within a trust group now expands to include liability for all trust groups. To be sure, the enabling legislation allows the WCB to do this. After all, someone has to pay and this is New York, so deal with it. In this case, the trusts that operated by the rules, fairly pricing and fairly reserving claims, are penalized for the sins of the clowns who are no longer in business. As we pointed out in yesterday’s post, a task force has recommended that New York get out of the self insured trust business. We concur. Any state that loads the dice of “joint and several liability” to this absurd point makes a mockery of the concept. Self-insurance is based upon the ability to limit risk and contain exposures. Given New York’s operating rules for self-insured trusts, conventional management tools are rendered useless. The liabilities of operating a group trust are uncontrollable and virtually infinite. Why would any company choose this path for managing risk? Two years ago, New York Governor Patterson convened a task force to examine the status of self-insured trusts for workers comp. He was forced to take action when a number of trusts failed, most notably those administered by Compensation Risk Managers (CRM). The insolvent trusts left behind a deficit of $500 million. (See our prior blogs here and here.) The task force recently presented its findings to the governor. In 189 pages of closely reasoned text, the commission recommends that New York abandon this particular model for insurance. The risks, in their view, outweigh the benefits and perhaps most important, the state lacks the resources to adequately monitor how these groups operate from day to day. You cannot trust the trusts. NOTE: it’s one thing to have “joint and several” liability; as the commission points out, it’s quite another to actually collect on these obligations: less than 15% of what is owed by participants in the failed trusts has been collected to date. Self insurance groups currently operate successfully in 18 states, but not in New York. As we pointed out in a prior blog, the NY comp board tried to assess all trust members – not just those in the insolvent trusts – to make up the $500 million deficit. The solvent trusts sued and for the moment, have prevailed. (The Held decision can be read in the appendix of the task force report). There is a certain logic to assessing all members for the failings of a few, but this only works when you are dealing with very large numbers, so the individual assessments are relatively small. This was not the case back in 2008, when there were about 18,000 employers participating in NY trusts. After all hell broke lose, the number dwindled to 4,000. The crippling assessments issued by the comp board to cover the trust deficit created a death spiral, with solvent trusts folding their tents and moving out of the state. Even though those assessments have been retracted by the courts, that action comes too late to save the viable trusts. New York probably has no choice but to abandon the group trust model. The New York narrative, as written by the governor’s commission, attributes the trust failures to fatal flaws in the business model. But where New York sees an insurance approach that cannot work, other states see vulnerabilities that can be addressed through prudent management. Self-insured groups still operate profitably and effectively in many states. What happened in New York was the result of rogue and perhaps felonious trust management combined with inadequate state oversight. The state failed to see the true status of the troubled trusts in a timely manner and then took exactly the wrong action to correct it. That’s not a problem with trusts themselves, but with the people entrusted to run them. For a biweekly risk roundup, check out this week’s edition of Cavalcade of Risk over at My Wealth Builder.